Let's face it, things change once you hit 40. And for me, that wasn't today or yesterday....I'm getting on up there and rapidly approaching 50! Our bodies change as we get a bit older, like it or not. Those pieces that looked good on us a few years back might need to be donated at this point. I have found myself looking for a few new pieces this year, to rev up a 'tired' wardrobe. Fortunately, we live in a time where there is a TON of inspiration to be found out there on the web! I would swap out the ripped jeans for a more 'tidy' look, but other than that I adore this combo. 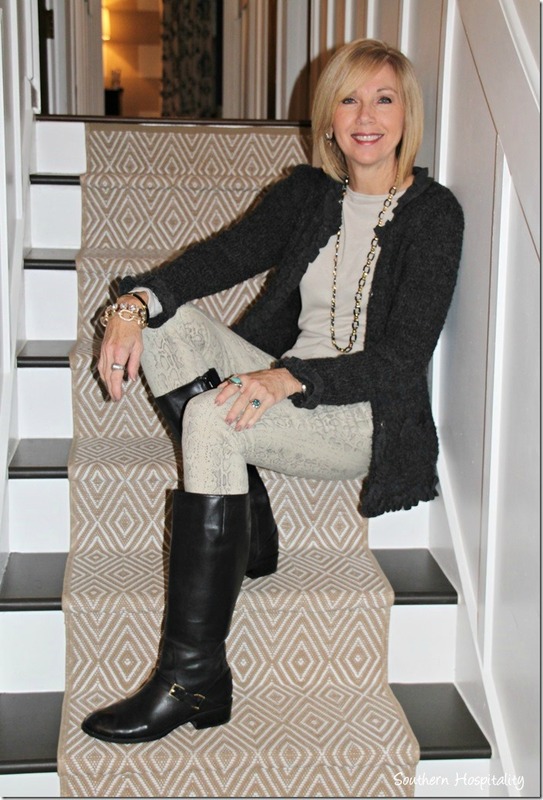 I'm always a big fan of monotone top/bottom with an accent sweater or jacket and matching boots. A perfect look for a casual lunch outing - cute, comfy, but not sloppy. Love the skinny jeans with the animal print ballet flats! Again, monotone top/bottom with an accent jacket/sweater. As much as I love those shoes, I would have probably gone with black. Love the necklace! Perfect for a day out on the town with friends. The boots really take this outfit to the next level for me - love them! Now, this is the perfect way to wear leather pants! What a fun look! I love the way she dressed it up with pearls, and yet has on very casual shoes....perhaps her dress shoes are in the tote? 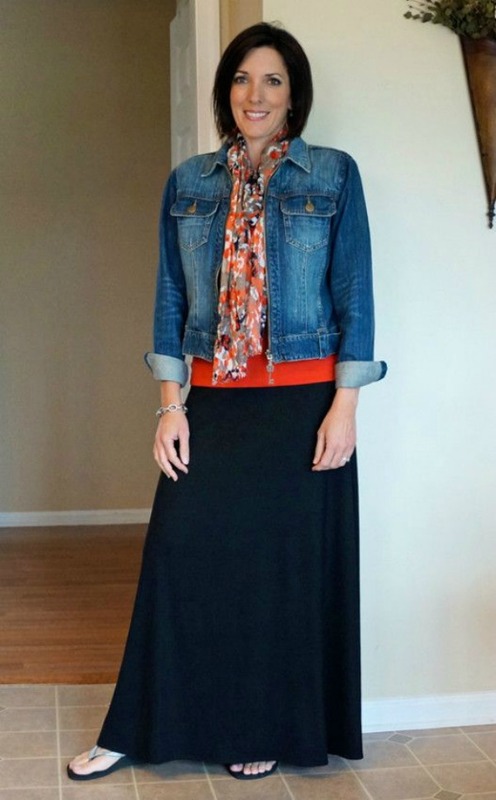 I love a maxi skirt for summer, and this is the perfect way to wear it. A tank, a scarf, and a denim jacket. Perfect! One of my favorite pieces ever is a poncho - I have a few of them in different colors and fabrics, and I just adore them! They are so easy to pop on over a pair of skinny pants, and they just look so on trend! This one is a poncho sweater, and I'd love to know where she got it because I just love everything about it! Gimme, gimme! This is a nice look for an elegant dinner in a beautiful restaurant - although I'm not sure how long my knee would like walking in those heels....sigh! I recently found Tania's blog and was immediately drawn to her funky style - I added her blog to my sidebar so I could keep up with her trendy looks and makeup tips. 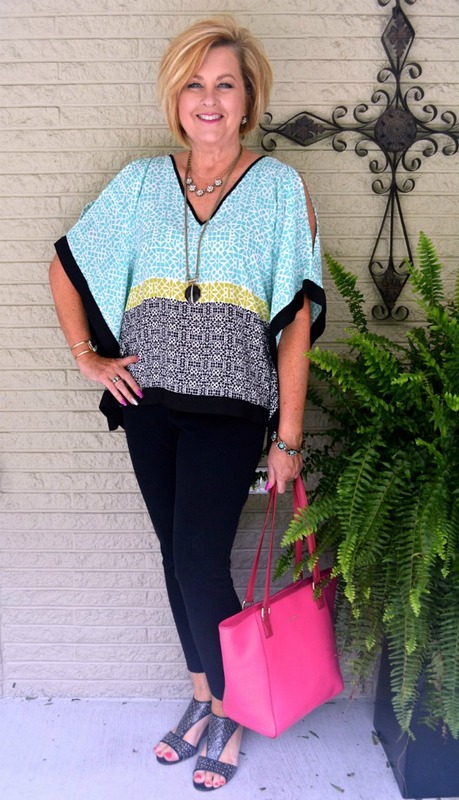 This boho poncho style top just screams out to me, and the bag and shoes finish it off beautifully! This look is just so cute! 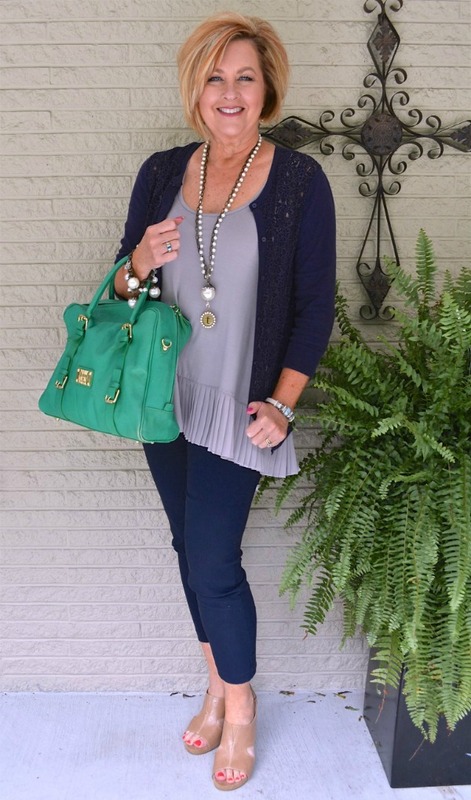 That tank with the pleated hem is adorable, and I love the skinny pants and neutral shoes with it. The green bag is unexpected but adds a great pop of color! I think we all have favorite looks that we gravitate towards, and we build our outfit around those pieces. Mine would be skinny pants....either leggings or skinny stretchy jeans...and boots. Lots, and lots of boots! What's your go-to fashion look? Ooh...makes me want to go shopping for fall! Fun inspiration photos...my favorites are the first two! They are both super cute looks with the boots - I wouldn't be able to get away with those torn jeans at work, so I'd need to swap them out for something 'neater' - sigh! I think we just need to realize that dressing young doesn't necessarily make us look young. Like the mother you see dressing like her teen-aged daughter, and it just.doesn't.work. Ya know? So true, Brenda. And we also need to realize that just because something is fashionable right now, if it doesn't suit us and look good on us, why wear it? I hate when I see women trying to pull off the latest trends and they just look awful in the fashion - wear something that flatters, not fights, your figure! They all look so pretty and trendy! Unfortunately, I need to lose about 70 pounds (yikes! ), so I feel frumpy in everything I wear right now. I am working on it, but it is a slow, painful process!! Thank you ever so much for stopping by my blog to read Dayle's interview! You are a blessing! Aww, I'm sorry, Cheryl - I wish you luck in your weight loss journey - slow and easy wins the race! Shelia, you are still young and vibrant! Age is simply a number - in my head, I'm still in my 20s or 30s yet my knee and my laugh lines tell me otherwise! Ha ha, same here, Kim. I used to LOVE my little skirts with tights and boots - but as I got older, the skirts got longer. Like you, I stick to skirts right above the knee now. Oh well....it is what it is! 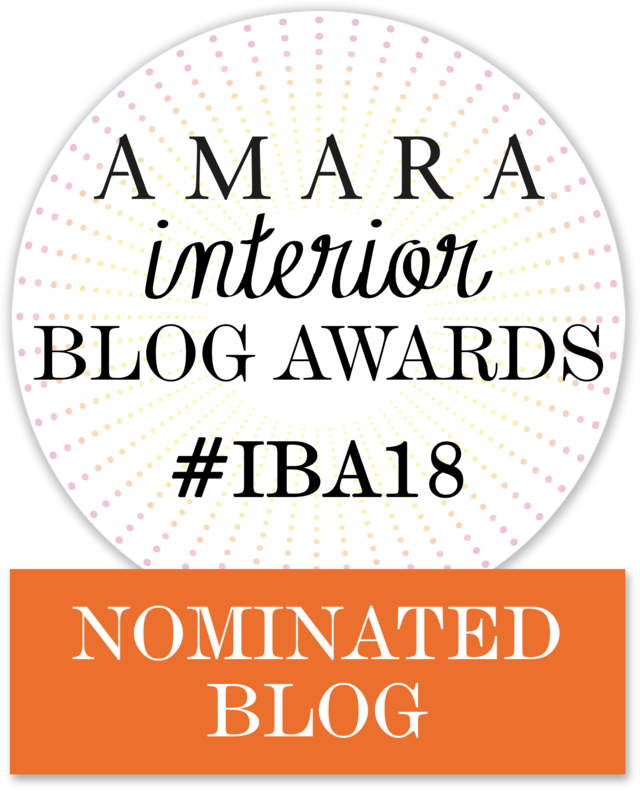 I follow all of those ladies' blogs - they are all so inspirational! I especially love Une Femme (3rd pic and a couple more)- her style is the one I relate to the most. My "uniform" is tunic/loose, flowy tops and skinny jeans. Can't wait for boot season again! 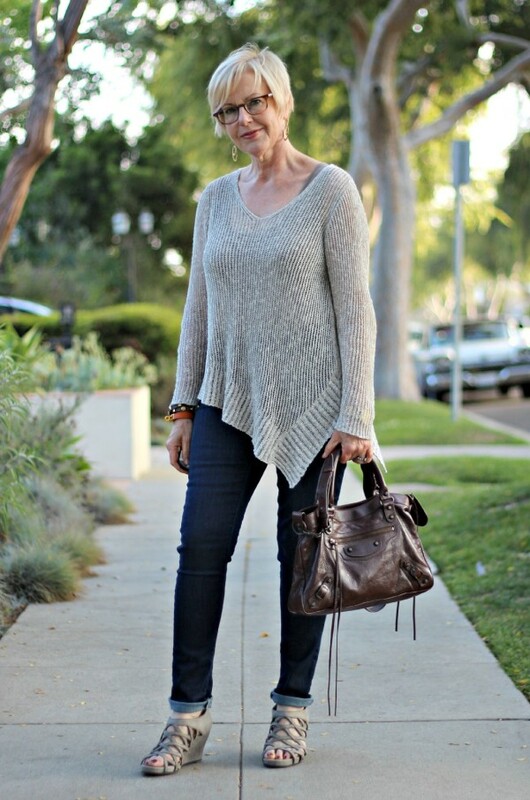 This post got me in the mood for cool weather dressing! I started out looking for summer inspiration but kept being drawn to the photos with the boots and layers - go figure, I guess I'm getting ready for boot season as well! Thanks, Rhonda! I'm going to have to do a little more snooping around their blogs now! I don't have a go-to fashion look - unless you count comfort as a fashion look. ;-) Don't get me wrong...I like to look nice when I go out, but otherwise, when I'm at home I'm all about yoga pants or shorts. I like the outfits in all the photos you posted, but I noticed one thing...they're all wearing high heels. Now that I'm almost 54 (6 days!) - you are a spring chicken, BTW - I absolutely can't do high heels anymore. They kill my feet. I think that's what's changed the most for me as I get older - although I still want to be fashionable, I'm not willing to sacrifice comfort for fashion. Whatever I wear needs to be comfortable as well. And I can't wear heels for long - occasionally I'll put on a pair but I suffer the next day for it. I had my knee rebuilt about 5 years ago from a skiing accident and it reminds me every single day! I love all of the looks (and the ladies) that you featured. You are right about our bodies changing as we age. I just turned 53 and menopause has not been my friend at all. I now gravitate towards skinny jeans and flowing tops that camouflage my problem areas. Darned menopause!! Wouldn't it be nice if we could find a way to bypass it? Love that first look the best, and like you I'd add some tailored trousers instead of the ripped jeans. I like fashion, wearing mostly slacks and flats, layered looks on top. I love hats and antique jewelry. Most of my friends look to see what pieces I decide to put together next. I would like more prints in my wardrobe. I am difficult to fit being short waisted and needing petite sizing or the necklines look off. 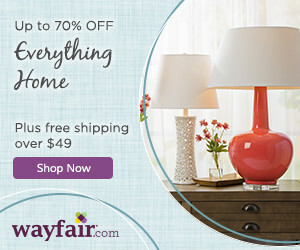 I'd love to see some fashion posts on your blog, Carole - especially since you are interested in it! We can all find inspiration from each other, for sure. I started wearing hats this year in the sun, and I am finding more and more of them that I love. You are definitely right about the body changing. Been there, done that! Thanks for including me with these other lovely ladies. I am flattered. Absolutely, Tania - love your blog, and your style! All of your fashion ensembles have great potential, don't they? Maybe, some change outs with the shoes! I always enjoy your post when I have a chance to read it. Please enjoy your current age (I think you do) but when you get closer to eighty than seventy (like me) every day is an "Oh my gosh day"! But, I think a little fashion is always fun and possible. Blessings. Thanks, Mary, for the reminder to enjoy my current age - because I might not be as young as I once was, but please God I'm a baby compared to what I WILL be some day! I enjoy all the ensembles put together here in your post. Love boots but can't wear them as often as I wish living in Arizona most of the year. I have to say... I follow many of the girls you showed here. They all are great inspirations! And being new to your blog... I am loving your posts! Thanks!! 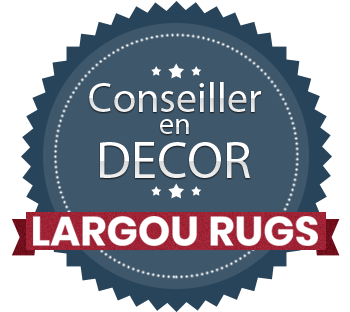 And welcome to my little blog! I love meeting new blog friends, and I will be heading over to check out your page next! Im in my late 40's too and often wonder if my style is to "young" looking at times. Im a fan of faded holey jeans and bagggy sweaters. My colors are earthtones. Im not big on bright colors or prints. I like your first pick here. I can't wear faded or holey jeans to work, although we are 'casual' attire it must be neat-casual. I can sneak in a pair of dark, neat jeans every once in a while...as long as they are paired with dressy pieces and nice shoes or boots. You and I are have very similar style preferences. I follow all the gals and like their choices. I must start following them all - I just found them quite by accident when searching for outfit inspiration! Great inspiration and a great group of lovely ladies showing off their style! Makes me want fall to arrive to wear my sweaters and boots. Have a great weekend! xo, T.
Same here! Although today it's all I can do to wear a tee shirt, it's so humid and sticky - yuk! Love most of your choices. Love boots and skinny jeans or leggings, too. Lately, I add tunics to the outfit. With the combo of warmer winters and hot flashes, too many layers just doesn't work for me. I love the look, though. I'm having a break from the flashes at the moment, thank God! But yes, I completely understand....sigh, what we go through!! Thank you for the feature, I appreciate it!! Lots more inspiration out there now for all of us over 50 and beyond. Absolutely! Love your style, glad to feature you! You hit my style on the head. Love the outfits. These days I need comfort as well as looking nice. Thanks for the share. Same here, Barbara!! Everything I wear these days has to feel good in addition to looking good! !